Superior taste takes time… but cheese lovers know that it is well worth the wait. Black Diamond Cheddar owes its distinct flavor to a unique aging process carried out under ideal conditions. This classic cheddar combines quality ingredients, the skilled eye and palate of master craftsmen, and careful aging, all of which come together to bring out the finest characteristics of taste, texture and appearance. Developed mature cheddar flavor with mild sharpness. Firm texture. Perfect balance between the mild cheddar flavor and mature sharp taste, great start for novices in aged cheddar. May have small salt crystals, which are a natural and desirable part of the aging process. Slightly drier and crumbly texture, with a matured cheddar flavor and pleasant sharpness. Shows some small salt crystals, which are a natural and desirable part of the aging process. Extra sharp taste, with a dry and crumbly texture. Shows some noticeable salt crystals, which are a natural and desirable part of the aging process. Intense sharpness and fully matured cheddar flavor with a dry but rich, brittle texture. Obvious salt granules and crystals. Spreadable cheese made with premium aged cheddar cheese. Made with premium aged Black Diamond Cheddar, our Extra Sharp Cheddar spreadable cheese has a full, rich classic cheddar flavor with a creamy texture, in an easy-to-use format for dipping and spreading. 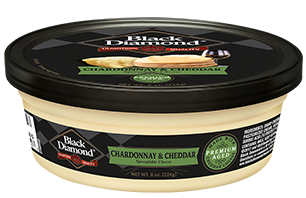 Made with premium aged Black Diamond Cheddar, our Chardonnay & Cheddar spreadable cheese has a full, rich classic cheddar flavor with the sweet, delicate taste of Chardonnay white wine. Made with premium aged Black Diamond Cheddar, our Merlot & Cheddar spreadable cheese has a full, rich classic cheddar flavor with the characteristically deep, slightly bitter taste of Merlot red wine.